Happy day after Thanksgiving, known in my world as Feel Good Friday! 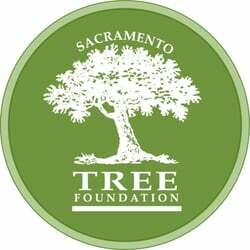 I'm in Sacramento this weekend and want to let you know about a local organization, the Sacramento Tree Foundation. The mission of the Sacramento Tree Foundation is "building healthy, livable communities in the Sacramento region by growing the best urban forest possible." Founded on Arbor Day in 1982, the Sacramento Tree Foundation (SacTree) is similar to Friends of the Urban Forest in San Francisco because they both offer education, advice, training and support for people planting trees in the community. Watch this short intro video for an overview. As they explain on their website, "a healthy tree canopy provides cleaner air and cooler temperatures, replenishes groundwater, enhances public health, and creates vibrant, livable neighborhoods." There are a variety of programs including: a seedling growing program for 3rd and 4th graders, an urban wood rescue program that salvages urban trees and mills them into usable lumber and the Save The Elms Program which trains citizen scientists to identify Dutch elm disease and provide monitoring data to City of Sacramento staff. Of everything SacTree does, my favorite is the Free Shade Tree Program. In partnership with the Sacramento Municipal Utility District (SMUD), residents of Sacramento County are eligible to receive up to 10 free shade trees to plant on their property. After meeting with a community forester, residents get to choose from over 30 deciduous trees. To date SMUD and SacTree have given out 450,000 free shade trees! If you don't live in the county you can check the Shady Eighty list to see what trees are good for the area and watch an instructional video on how to plant a tree. With the goal of planting 5 million new trees in the region the Sacramento Tree Foundation can use your help. You can become a tree planting and care volunteer, a citizen scientist or if you don't live in the area make a donation and share the social media love by liking their Facebook page and following them on Twitter @SacTree.